Gordon Henderson submitted this photo and caption. 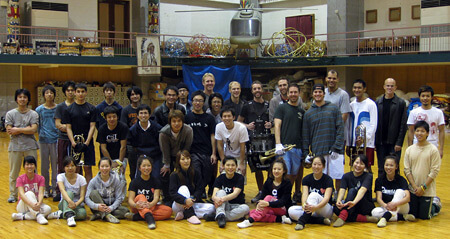 Thirty-five current and former members of Drum Corps International corps are now members of the Tenrikyo Aimachi Marching Band from Nagoya, Japan. They are preparing for the All Japan Championships in Tokyo this weekend on Dec. 21. This group includes nine Americans and represents various corps including the Cavaliers, Santa Clara Vanguard, Phantom Regiment, the Cadets, the Blue Devils, Carolina Crown, Blue Stars, and the Troopers. The photo was taken at the band's rehearsal facility with props from past shows in the background, including the famed helicopter from their "Miss Saigon" show in 1998 which marked their first National Championship. The Aimachi Band has won the Championship a total of six times.